The cost of the first project is 8bn hryvnyas (302m dollars). 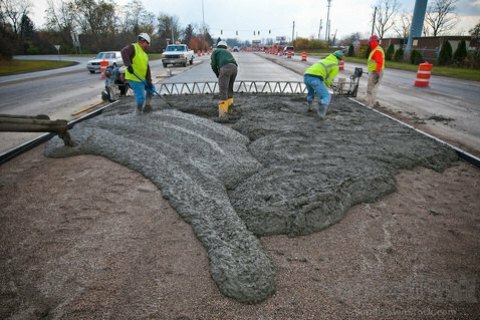 The Ministry of Infrastructure of Ukraine is planning to begin in 2018 three pilot projects for the reconstruction of 232 km of roads with cement concrete surface. The total cost of the project is about 8bn hryvnyas, Interfax-Ukraine reported from a meeting of the parliamentary transport committee on Thursday, 16 November. The first project is the reconstruction of the northern bypass of the city of Zhytomyr on the highway M-06 Kyiv–Chop (22.3 km). "It is planned to upgrade the road to 1b category which involves road widening from 2 to 4 lanes, the estimated traffic capacity is 14,000 cars. Planning permissions are already in place," the director of the road market strategic development department of the Infrastructure Ministry, Viktor Sasin, told the agency. The representative of the State Agency of Highways of Ukraine, Ukravtodor, Andriy Chabanovskyy, put the planned cost of reconstruction financed with an EBRD loan at 1 bn hryvnyas. The 5.4bn-hryvnya investment project of the renovation of the H-31 Dnipro-Reshetilivka motorway provides for road widening from two to four lanes and covering the surface with portland cement (137 km), Sasin said. The capital overhaul of the highway H-11 Kropyvnytskyy-Mykolayiv within the boundaries of Mykolayiv Region (73 km) also involves re-topping with cement concrete, Chabanovskyy said. The project estimated at 1.6bn hryvnyas is planned to take off next year. Former Deputy Minister of Infrastructure Volodymyr Shulmeyster said that concrete roads are 40 per cent less expensive than asphalt roads over the span of 20 years of service, as the latter require maintenance repairs every six to 12 years.